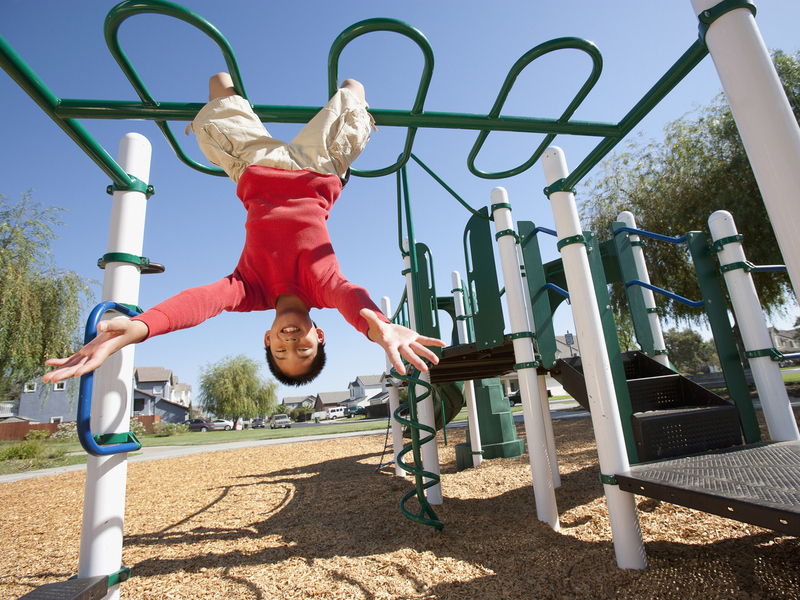 Is It Time To Bring Risk Back Into Our Kids' Playgrounds? : 13.7: Cosmos And Culture Are playgrounds in the U.S. too sterile and risk-averse to help our kids thrive? Anthropologist Barbara J. King considers play and child development in evolutionary perspective. Is It Time To Bring Risk Back Into Our Kids' Playgrounds? I think it's fair to say that many parents focus a lot of energy — and worry! — on protecting their small kids from risky situations. But it turns out that integrating limited risk into our kids' playtime may be taking a step toward healthier child development. This past weekend, reporter Ellen Barry published a piece in The New York Times about a growing movement in Britain to bring risk into the playground experience. Measures include: erecting handmade play equipment like 20-ft. climbing towers; leaving intact gorse bushes that are quite spiky; supervising children in the use of knives, saws, and other tools; and building fires right in the play area. The idea is to build "resilience and grit," rather than coddling children with the less-than-challenging plastic play structures common to U.S. playgrounds. Barry cites a sign posted outside the Princess Diana Playground in London's Kensington Gardens, which tells parents that risks are "intentionally provided, so that your child can develop an appreciation of risk in a controlled play environment rather than taking similar risks in an uncontrolled and unregulated wider world." Controlled risk at play time — where, after all, the children are still under close supervision — would seem a good complement to the free-range child movement in this country. In that initiative, as I wrote in this space in 2015, "free-range kids of elementary school age are encouraged to take walks in nature, ride public transportation on their own and, generally, to get outside, stay active and acquire independent skills." It's common enough to see the argument made that "risky activities give kids a chance to develop confidence and competence as they master challenges." But could an evolutionary perspective — as well as a cross-cultural one — on child development add some weight to this view? After all, we humans are primates and we've been shaped by our long evolutionary trajectory as such. It's a natural question for an anthropologist to ask: Is risk natural and healthy for young primates? "I would say that risk and risky play in particular is a vital part of our animal/primate heritage. It is through our engagement with risk, or any unfamiliar or uncomfortable situation — in the context of play, which is of course fun for a juvenile animal of any species, but in other contexts as well — that we learn how to use our bodies safely to interact with the physical and social challenges in the environment. " "Naturally," she noted, "one of the things immature primates must learn is how to successfully cope with and navigate the physical and social challenges that are ever present in the world. Learning how to balance yourself on a log is just as vitally important to survival as learning how to respond appropriately to the friendly, or less than friendly, gestures of the other animals with whom you live." And it's not just playgrounds. In Germany, outdoor "forest kindergartens" are popular, and in Norway, too. Once in a while, kindergarten teachers in the U.S. adopt a similar practice, as happened during "forest Mondays" at this elementary school in Quechee, Vt.
"After a year of having weekly campfires at her Norwegian preschool, my 3-year-old knows how to behave around a campfire. A few of her American relatives, who were initially skeptical about children as young as a year old sitting around a campfire singing songs in Norway, concluded that her exposure to the campfires (in a controlled risk, fun-filled setting) was enriching to her personal growth and development after all. I couldn't agree more. And I wish more children had access to these kinds of physically and socially enriching activities on a regular basis because, as the age old adage goes, 'knowledge is power.' A child who understands through personal experience the true costs and benefits of engaging in any sort of activity is a more informed individual, one that is more capable of looking after themselves, and a better (future) citizen of the world." Barbara J. King is an anthropology professor emerita at the College of William and Mary. She often writes about the cognition, emotion and welfare of animals and about biological anthropology, human evolution and gender issues. Barbara's new book is Personalities on the Plate: The Lives and Minds of Animals We Eat. You can keep up with her on Twitter @bjkingape. An earlier version of this piece stated that Nga Nguyen worked at University of California, Fullerton. She is with California State University, Fullerton.